Steps for Life sponsors come in all shapes and sizes – and every one of them makes a difference to health and safety and the lives of people affected by workplace tragedy. 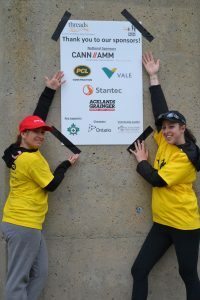 The businesses and organizations which support Steps for Life – Walking for Families of Workplace Tragedy range from Stepping Forward sponsors investing $250 in their local walk to national walk sponsors donating $10,000 and more. And in 2016 there were more than 200 sponsors at 30 walks from coast to coast! Every one of those dollars is needed and valued – each one contributes to the services Threads of Life provides to help individuals and families heal after a work-related fatality, life-altering injury or occupational disease. Steps for Life sponsors reap benefits too. Every level of sponsorship offers forms of recognition such as a logo on t-shirts or signage, space to exhibit at the walk, and even a chance to officially welcome walkers to the event. It’s close to home – there are walks in 30+ communities across Canada. Steps for Life walks are organized by people in your community and the participants come from your neighbourhood. Steps for Life sponsorship suits all budgets – Steps for Life offers opportunities ranging from $250 Stepping Forward sponsorship to a $2000 Champion level. Or think about sponsoring nationally! Lets you demonstrate leadership – show the community your commitment to health and safety. A chance to support families – your sponsorship dollars directly fund Threads of Life programs and services for families affected by workplace tragedy. Help to build safety culture across the nation – Steps for Life aims to make everyone more aware of the importance of workplace safety. By becoming a sponsor, you are part of that national movement. One can make a difference – and with Steps for Life sponsorship, that one can be you!